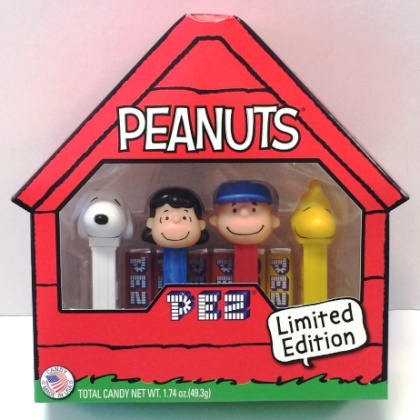 Peanuts is celebrating their 65th Anniversary in 2015 with a limited edition Pez Collectors Boxed set. This set of 4 includes Charlie Brown on a red stem, Lucy on a blue stem, Snoopy on a white stem and Woodstock on a yellow stem. These 4 new Peanuts pez come in a cardboard box shaped like Snoopy's. 6 refill packs. Total candy weight is 1.74 oz. Approx. 8 inches wide by 8 tall by 2.25 inches deep.